As the year 1992 drew to a close, many gamers were enjoying the new consoles that arrived to them on Christmas morning. Many children (and adults) sat willing the hours away on their shiny new Super Nintendo’s, and if Super Mario World wasn’t enough to hold their attention, Capcom released a late hit on December 31 to add to the late Christmas glee. 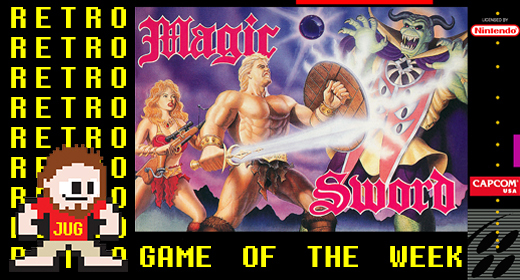 Magic Sword, a port of a 1990 Capcom arcade hit, tasked players with taking on the role of an axe-swinging warrior (something not unfamiliar to them by this point) as he battled his way through the levels of a nefarious tower. At the end of this journey was great treasure, glory, a beautiful princess, and all the other trappings of a throwaway fantasy plot. The plot is not the shining crown jewel in this game, it is the excellent game-play and unique side-kick system. Our hero, named simply “The Brave One”, would not be battling the hordes of evil alone. A stable of side kick characters, ranging from warriors, ninjas, mages, to giant lizard-men can be freed with special keys throughout the levels and will join the player for a short time. The allies are AI controlled, and only attack when the player attacks. All the while running at a smooth frame-rate, the side-kick system adds variety to the stages and helps the side-scrolling action from becoming too monotonousness. 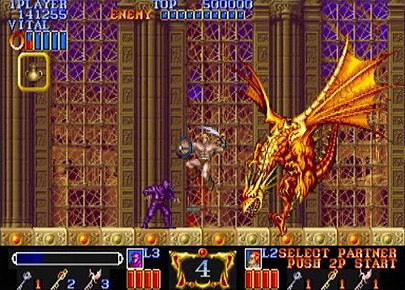 Each stage includes boss encounters encompassing the usual fantasy foes, dragons, medusas, spirits and the like. Enemies you have vanquished well before and will probably never tire of. The levels all contain varied backgrounds and enemies, and the leveling system ensures your warrior is always gaining in power and equipment. 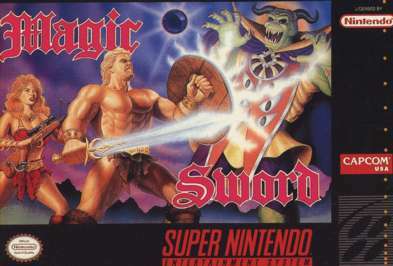 Magic Sword is so much more than a typical side-scrolling slasher with a medieval setting, it contains RPG elements as well. While critically the game enjoyed much success, sales wise the game faded somewhat into obscurity. Copies are easily found today but due to the relatively light sales the prices tend to be more elevated than typical SNES titles. Regardless, it remains one of the more hidden gems of the SNES library and one of my favorite 16-bit games of all time. Check it out if possible on the original SNES, but also be aware it’s available as an excellent port on Xbox Live and Playstation Network. These games added a graphical face-lift along with online play. Slashing through 16-bit baddies is just as fun now as it ever was.